C# Programming: From Problem Analysis to Program Design requires no previous introduction to programming and only a mathematical background of high school algebra. 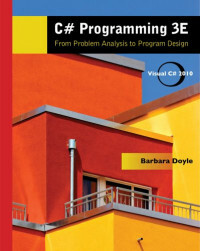 The book uses C# as the programming language for software development; however, the basic programming concepts presented can be applied to a number of other languages. Instead of focusing on the syntax of the C# language, this book uses the C# language to present general programming concepts. It is the belief of the author that once you develop a thorough understanding of one programming language, you can effectively apply those concepts to other programming languages.